Tim Burton and Johnny Depp have becoming increasingly known as the filmmaking team of unintentional nightmares. 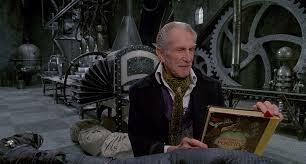 However that is certainly not the case when the highly influential cult classic Edward Scissorhands (1990) is involved. Influences haunt the film throughout, the first straight off the bat as the creation by the The Inventor (awesomely Vincent Price) of Edward openly suggests Frankenstein, both in Mary Shelley and numerous other iterations. The grandmother relating the kid the film in the form of a bedtime story recalls The Princess Bride (noting that is a trope with origins far longer than that book/film). There is a Blue Velvet (1986) era Lynchian sheen to the hyper-suburbia settings. It takes a lot of storytelling skill to be so openly influenced by greats that have come before, but to never feel derivative or lesser as a result. Like a great musical cover, homage such as this, whilst not necessarily surpassing the source, can provide something different and equally worthwhile. This even extends to the central character of Edward, who evokes the character of Pinocchio, with his exaggerated boyishness and the sense that while close, he’s not quite human. Living in an age of films with exhausting, lengthy set-ups (hell, that’s the entire function of some films), this sort of floors you with how quick it gets rolling. Edward is on his way home with his adoptive family within about the first 15 minutes. From there, a lot of the early joy of the film comes from the domestic minutiae, such as Edward attempting to put his pants on. Throughout the entire film, but especially in these parts, Johnny Depp gives a performance with a physicality that borders on slapstick. Happily, going back 25-odd years means that the performance is not weighed down by his atmosphere sucking shtick. The other lead, Winona Ryder gives what is also probably the best performance of her career. She brings a whimsy and teenage hard-headedness to her role and quickly accelerates the strong bond between her Kim and Edward, which does not really get going til a fair way through the film. 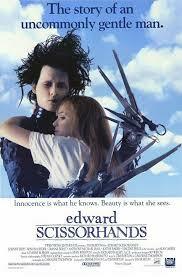 For a relatively modern film, Edward Scissorhands has exceptional reach. The film is a big (borderline obsessive) touchstone for the goth and emo subcultures, as well as being a formative film for a huge range of people outside of that. Given I don’t and never have belonged to either of those subcultures, I won’t presume to know the entire connection. Part of it would be the presentation of notions of ‘right’ and how that does not always represent the nicest or most humane thing to do. But I would also guess the fact that the film is something of a portrait of an outsider plays a major role. The film both works and doesn’t on this front, with Edward’s difference accepted and feeling slightly exploited throughout. Though what it does capture very well is how if you’re different, any mistake will have you judged completely, through the prism of magnifying and demonising one’s quirks. There is something distinctive about the aesthetic design of the film. Sure there is a dash of the Lynchian as I mentioned earlier, but Burton possesses that and turns it into something of his own. Predominately this is achieved by splashing light gothic elements and tone throughout the visual look, providing an old fashioned contrast to the sheen. This combination suits the character of Edward perfectly. Even the casting seems to tap into this vibe, especially that of Vincent Price, who cooped up in that scary house on the hill, channelling Dr Frankenstein, functions as both an aesthetic choice and smart piece of casting. Throughout, the filmmakers seem to be toying with the look of it all, the house on the hill for example looks intentionally fake. This toying with form, across a range of the aspects of the film, is something Burton seems far beyond now. On some rare occasions, the film does feel a little over-stylised. But unlike Burton’s later films it never feels as though the showy style has become the point of the film, the attention to story and emotion is never overwhelmed. Danny Elfman is a composer indelibly linked to Burton’s work. I can’t say I have seen all of the films they collaborated on, but I struggle to imagine any of the scores being better than this one. Like so much else in the film, there is a playful interaction with something of the past, in this case classical music. The result simultaneously evokes the suburban and just as importantly deftly emphases that light gothic sensibility which makes the film so unique. Related beermovie.net articles for you to check out: A Tribute to Dennis Hopper: David Lynch’s Blue Velvet and Live Tweet Review: Batman. I also like this film. It’s combination of fantasy and reality create not just a distinct and memorable visual style but also an interesting metaphor for humanity’s weaknesses. 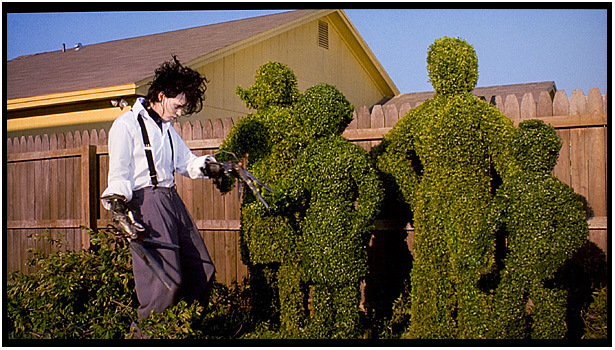 I find Edward Scissorhands appeal hard to explain, but I do hope you know what I mean. Thanks for reading Paul. That combo of fantasy and reality you talk about is spot on. So unique and so hard to pull off, but this film does it exceptionally well. I’ll be doing a Burton feature for What’s Their Best Film? in the near future. I get a feeling Edward Scissorhands will fare quite highly in the voting. I suspect so. It would definitely be my favourite of his.